Our last day in Japan consisted of a lot of travelling, and during this time, I was able to reflect a lot on the experience I’ve had in this class thus far. Spending my last 500¥ was a very intimate moment between myself and the cashier at Muji, a very high end, minimalistic store in Japan. With 500¥, I was able to buy an eraser, which better be the most flawless eraser of all time. 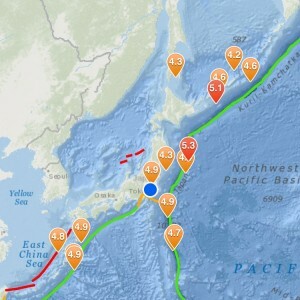 Also, I cannot help but mention that on our last morning in Japan, I experienced a 4.9 earthquake, and got completely excited. I know that this reaction is probably not the best to have during an earthquake, but knowing how small its magnitude was and how seismically safe the buildings in Tokyo are, I think my feelings at the time were pretty validated. Growing up in California, I have always been fascinated with earthquakes and plate tectonics in general. Experiencing an earthquake in one of the most seismically active zones on the planet DEFINITELY had me jumping up and down (mentally and quite physically). Not to mention, when I got the notification from one of the many seismic apps on my phone, tears welled in my eyes– a girl’s dream has finally come true. I had to screenshot the overlap of my location and the location of the quake so I could look back on the wonderful moment in years to come. On the half-day flight, I managed to write some more poetry and such on my experiences in New Jersey and Japan, specifically pertaining to natural disasters (while Three-Mile Island was not necessarily a natural disaster). Through this, I found that many of the people we interviewed were women. Being the only woman in this group, this was not really noticeable to me until one of my colleagues pointed it out, which was quite interesting since I usually notice these patterns when analyzing another person’s research. The women were also mainly mothers that were concerned with the situations at hand. In a previous blog, I mentioned that many families were split up because the concern mothers had did not match up with those of fathers. Similar situations occurred in New Jersey (referring to the mother that left when the evacuation notice was given and the father that stayed), which I did not expect to find in the Japanese response to disaster. Ultimately, I have realized that the most damage from all of the disasters we have studied have been social and emotional. Since it is too early to tell whether the Fukushima explosions caused radiation-related diseases and the casualties of Sandy and Tohoku have very finite numbers, the amount of families and communities that were and still are affected by these events surpasses the numbers. As a result, economies and local governments are seen as criminal and many communities, both in the United States and Japan. In the future, governments must recognize the potential ethical dilemmas that may rise from ignoring certain populations of people. Earlier this week our group was given a guided tour of the town of Tomioka, a small city affected by the 3.11 earthquake and later the Fukushima nuclear accident. As we walked in and around town, we saw signs of earthquake damage such as large cracks in a few buildings and a bit of damage to road surfaces, but nothing so bad that the community couldn’t recover. 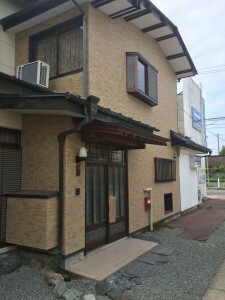 However, it was an invisible enemy keeping Tomioka’s residents from coming home. Just north of the town sits the Fukushima Daichi nuclear power plant. During the tsunami in 2011, the plant’s cooling systems, used to keep its radioactive fuel from melting, failed, triggering a massive meltdown and subsequent explosions on four of the six of the facility’s reactors. These explosions caused extremely hazardous amounts of radioactive material to be launched into the atmosphere and eventually make their way down to the surface around the vicinity of the plant. 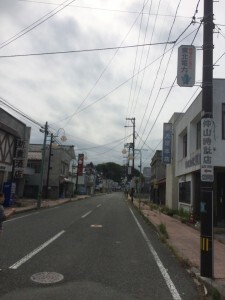 Several towns like Tomioka were evacuated immediately and told they would be able to return to their homes, but most still have not been able to come back. 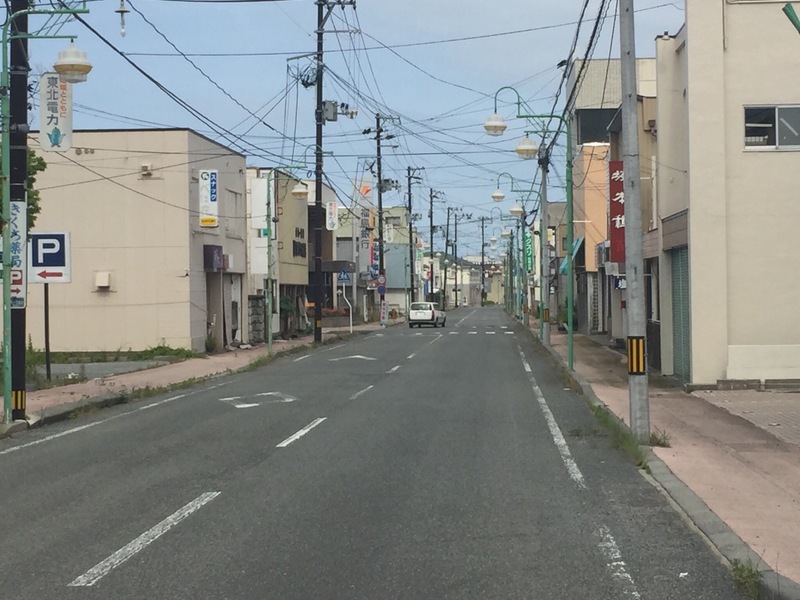 Many residents of Tomioka will be allowed to return in the coming months, but many others will not due to varying radiation levels making some parts of town more livable than others. Even the townsfolk who will be allowed back in soon are hesitant to return due to the elevated levels of radiation in the area, as there are many questions that still need to be answered, such as: what will be the long-term effects of the elevated ration levels in the area? If we do move back, will there be others there to help rebuild the community or will we be living in a ghost town? 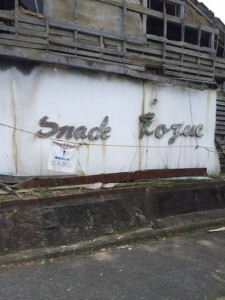 Another factor contributing to the uncertainty of the area’s repopulation is the community’s distrust of the government and of TEPCO (Tokyo Electric Power Company), the corporation that owns the Fukushima Daichi plant. Even though both entities agree that the levels of radiation in parts of Tomioka and in most of the rest of Fukushima prefecture are safe, many citizens are skeptical of their data and its reporting. 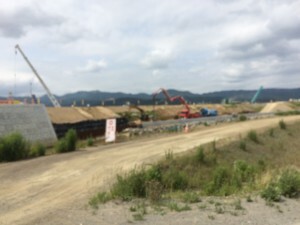 They believe that Abe Shinzo’s administration, along with TEPCO are trying to downplay the scale and effects of the disaster in order to avoid any bad publicity in advance of the 2020 Olympic Games coming to Tokyo, as many athletes might end up residing in the Fukushima prefecture for the duration of the games. Such skepticism towards the powers that be, along with the fear and stigma surrounding radiation itself has made life more complicated for many, even on the other side of the prefecture. 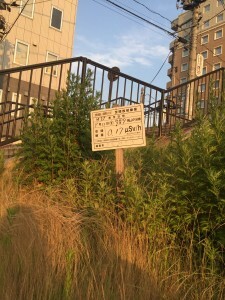 In the cities of Aizu and Koriyama, far outside the declared disaster area, people are so worried about radiation from the plant that they refuse to let their children play outside and have set up special programs that take kids to other prefectures so that they can play outdoors. Additionally, even though radiation levels in these cities are perfectly safe by all established standards, many are still worried about everything from where they travel to what they eat. Such fear, antagonism and distrust of authority, warranted or unwarranted, has and will continue to make life difficult for large numbers of people living in the prefecture, in addition to those directly affected by the accident. Early in the week, our group took a drive along part of Japan’s northern coast, some of the hardest hit areas by the tsunami. Much of the area we drove through had been inundated by the massive wave and places that were once filled with houses and shops were now empty patches of overgrown land.construction of new sea walls seems to be going on wherever one looks, and the sound of heavy equipment is inescapable. Many roads and bridges wiped out by either the tsunami or the earthquake that preceded it have not yet finished being rebuilt. Even some train lines have not been replaced, as the government has gone with the option of using buses to fill the gap instead. 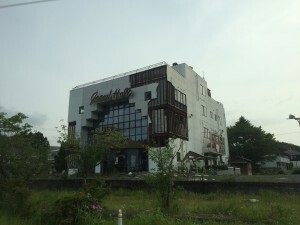 Multiple structures have also been allowed to remain standing as a testament to the death and destruction caused by the earthquake and tsunami. We visited what was an elementary school before the tsunami hit, but is now a dilapidated concrete memorial to victims of the disaster. It was hard to imagine a wave large amount to completely engulf the four story building built on a ridge relatively high above the water. The wave was so large that it swept into the inlet from the ocean, up the ridge on which the school stood, and over the roof, sweeping all who sought shelter there away. In other towns along the coast, sea walls now stand where houses and businesses once did, as most residents affected by the tsunami and were able to rebuild have moved their homes farther above the water or moved out of the area permanently. Seeing exactly where the water came up to and just how much destruction it caused that is still visible even five years later really helps one to understand how terrifying and devastating it must have been for people more than any boom or television documentary could. Seeing images and remains of the disaster at first made me think that none who had lived in these areas before would want to move back, due to the great financial cost or the awful memories of the tragedy in addition to a multitude of other reasons. However, I was and still am amazed at the resiliency of the people here. Even now, as the sea walls are still unfinished, residents are building homes and other buildings on higher ground, preparing for the next great tsunami that will inevitably strike the shore again. Shopping centers have also been set up with assistance from the government to help local business owners who lost everything to the disaster to get back on their feet and, in turn, help the local economy at large start anew. The employees and customers in the shops we visited seemed to be in high spirits and hopeful that their communities would thrive again. In my opinion, the people of these formerly disaster-stricken areas are a shining example of how devastating events like earthquakes and tsunamis should be responded to. Not only have they survived and managed to keep their communities intact, they have decided not to abandon their homeland and are determined to build a better and safer place to live. On Wednesday Professor Bates took our group on a day-long walking tour of Tokyo. We visited the metropolitan building in Shinjuku and then went to the Shinjuku Goyen before walking through Harajuku and the Meiji Jingu. 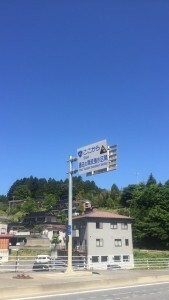 All over the city there are signs of the city’s preparedness for natural disasters, particularly earthquakes. 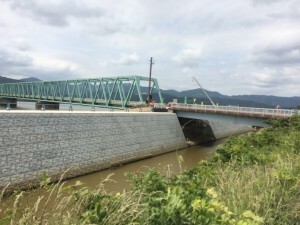 For example, many bridges have been either constructed or retrofitted such that they will shake with the ground in the event of an earthquake and will not collapse nearly as easily as standard structures. Skyscrapers such as the Tokyo Metropolitan Government Building we visited in Shinjuku are also built to withstand earthquakes. 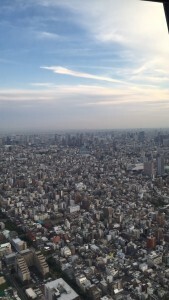 The Metropolitan Government building, in particular, is designed so that every chunk of ten floors will shake independently so that the building will not collapse. Another striking thing about Tokyo is how clean it is. There was hardly any trash scattered around the city, thanks to the legion of workers constantly cleaning up litter and performing other janitorial duties. Even regular employees of businesses are made to clean up the premises in the morning, making every block of the city free of any loose trash or debris. Yesterday we went to the fish market around very early in the morning and saw all kinds of seafood. We went to an authentic sushi restaurants and I tried so many foods I had never had before like Eel, Octopus, Sea Urchin, and Squid, and to my surprise I enjoyed everything that was put in front of me (with the exception of the Sea Urchin). After that, we explored the city a bit more, visiting a disaster preparation center, where we took part in a simulated earthquake and its aftermath and learned about the best survival techniques in the event of a massive earthquake, and the Tokyo Edo Museum, a museum specializing in the history of the city of Tokyo. In the evening we went to a university in the outskirts of Tokyo and talked to some students about their experiences with the earthquake in 2011. Their firsthand accounts of what happened were very insightful and we learned so much from them. After that we went out to dinner with those of them who could come with us as well as their professor which was an amazing experience. We learned more about Japanese culture and society just from talking with them over dinner than any lecture could . Hopefully we can get back together with them when we’re heading back through Tokyo on our way home next week. This past Saturday and Sunday were very educational thanks to a local geologist in the Tom’s River area of New Jersey. When we arrived in Tom’s River on Saturday she welcomed us and gave us a few introductory lectures about the events surrounding Hurricane Sandy and the aftermath of the storm before we had the opportunity to interview two of her friends who lived in the area when Sandy hit. The information they gave us was very eye-opening and will no doubt be extremely valuable when the time comes for us to put together our projects. After having a great New Jersey diner dinner, the six of us went out to the boardwalk to explore. The New Jersey boardwalk unlike anything I’ve ever seen. There was so much to take in with all of the vendors, great-smelling food and massive crowds of people. The next day was a great experience as well, as we got a day-long tour of the jersey shore area, checking out the damage done by Sandy that still hasn’t been cleaned up as well as talking with some more residents who experienced the Hurricane’s effects firsthand. One couple we talked to had four feet of water in their house as a result of the storm and they told us about their neighbors, who lost four vehicles in the chaos. As we were driving around the various communities in the shore area, it was amazing to see how many empty lots there still were years after the hurricane swept through. Many people, rather than try to rebuild, simply left their damaged homes and moved away as it would be more costly to repair their home on the shore. Many of these homes remain today as, aside from the cost of purchasing the home itself, any potential buyer would also have to pay to have the home refitted to meet new building standards put in place after Sandy hit. These regulations include having the house raised a few feet to prevent flooding in the case of another hurricane, a renovation that can be extremely expensive, depending on the size of the building. As a result, many vacant houses sit in the shore area waiting to be bought and lived in despite the high demand for oceanfront property. It made me optimistic, despite all of the empty lots and still-damaged homes, to see that many people had rebuilt their homes and this time had taken proper precaution by constructing their new homes on stilts so that they would not be flooded if another hurricane were to come through and cover the shore area with water again. North-eastern Japan was very different from Tokyo. From the larger roads to the mountainous terrain, the Tōhoku region gave me another reason to fall in love with this country. Our experience up north was mainly divided into two sections of study: nuclear disaster and natural disaster. In Fukushima prefecture, we interviewed many individuals that were directly affected by the Dai-Ichi explosion in March of 2011. Many of these people were moved into temporary housing because of the earthquake’s damage and/or dangerous radiation levels in their communities. The other majority of people we interviewed were concerned mothers that changed their family’s lifestyle to accommodate for a safe environment for their children. Because of this, many families were split up by their mother’s precautions and their father’s disagreement with the extremities of these safety precautions. For instance, some mothers decided to keep their children indoors and not allow them to play outside and others moved from dangerous cities entirely, leaving their husbands behind to work. Many couples did not agree on the potential for danger with high levels of radiation in the atmosphere, and continue on living separately. Because of this, many mothers we interviewed were afraid to communicate their fears of radiation poisoning and danger in their area with the larger public, resulting in small groups of mothers spread across the Fukushima prefecture. Many mothers met without their husbands knowing simply to avoid conflict. As we trekked further north, we saw the earthquake and tsunami damage closer to the epicenter of the 3.11 disaster. This was one of the hardest parts of the trip. We visited the Ogawa Elementary school where almost all of the people on the roof of the school went missing or passed away as a result of the tsunami’s height. Some escaped to higher grounds, but others did not. This experience really emphasized the intensity of the tsunami and how large the surge was because even though these people were prepared for disaster to strike, they could not have been prepared for 3.11. Seeing the elementary school and other devastated areas like the Disaster Response Center in Minamisanriku where many deaths happened as well made me wonder whether disaster preparedness is really possible. Yes, there are basic things everyone must know to do such as store food and water and extra clothes, but the intensity of disasters cannot be predicted as much as we want to believe they can. The term “disaster preparedness” is actually contradictory in itself. Must we redefine disaster preparedness? Can we even be really prepared for disasters like the “big ones” scientists talk about all the time? This particular mother we will call Bromden. Five years after the disaster she has doubtlessly told her story a dozen times, and we have heard it a dozen times before. But if her calm clarity in recounting her story is not enough, her concerns for safety are affimed in her assertion that she will never live in her old home, or in her old town again. Bromden does not trust the government. She does not trust Tokyo Power and Electric (TEPCO), and she does not trust the doctors. The government tells her that it is safe to move back in… if you live on this side of the road. Tepco tells her that any house built more than fifty years ago is worthless and deserves no payout, regardless of the damage they have inflicted upon it. And the doctors tell her that the cysts and nosebleeds in the local children are acne and nothing. Bromden is worried for her children, but her children were grown at the time of the disaster, and take her concern as a grain of salt. 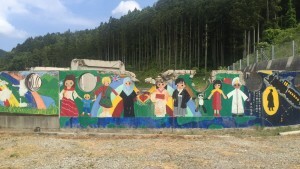 We’ve talked to several mothers who’ve lived in Tomioka, some say they will return, some say they won’t, and some have no idea, even as the date of the government sanctioned repopulation of the area looms. Our interview draws to a close as we discuss economic ramifications and impact of the disaster on the community. She says she can understand the economic desire for a nuclear power plant in her backyard, but it seems to make little difference who wanted what now that it has exploded and irradiated half the prefecture. The past week has been filled with narratives that I am not sure how to share in words other than a poem. You are not who I expected you to be. are not who they expected you to be. Concrete walls like Lego pieces, your job to disassemble. You are reclaimation of space and decolonization in its purest state. cousins into alcoholism push yourself onto shores familiar with your frequent kisses but not your abuse and you push. Only now must we realize that you push. Driving through the mountains, along the shore of Onagawa, the thing that stands out the most is the reconstruction. Over five years after the tsunami has struck, it takes an earth scientist and one of the first volunteers to flock to the area to identify any lasting damage from the great wave. Freshly painted houses colonize the cliffs, roads and seawalls trace the shoreline, crisscrossed by glittering bridges. But the work is far from done, driving along the new road the cranes, trucks, and workers responsible for these structures and those awaiting completion are never out of site. It is hard to be melancholy about what is lost, when such titanic efforts have been made to rebuild. But it is not the yet the same as it was before. Though the construction workers are everywhere, the people of this town are nowhere. Aside from a few fishermen tending to what appears to be very healthy oyster farms, there seem to be no people who aren’t attending to the construction. Searchingly, our Toyota scales the mountains, taking us into the residential neighborhoods. Though the new sea wall is much higher than its predecessor, it is not as high as the waves of the tsunami were; the architects of this new town know this well, placing it high above the crashing waves. As the ocean looms ahead of us, we turn to our left and to our right, inspecting the newly minted retrofitted houses. The closest people to us appear to driving along the main road, hundreds offeet below, transporting dirt in their cute little japanese dump trucks. The houses seem to be empty. We drive through the cliffs to view the entire bay, lined by buoys signifying oyster lines. We get lost among the new residences, our guide makes k-turns without checking for other cars; there is no need. We drive parallel to the sea wall and watch trucks and cranes flatten the earth among the deforested mountains to make room for more rows of houses. After we think we have seen the entire bay, we stop by a temporary shopping center. I use the bathroom and go into an empty convenience store and purchase a piece of freshly baked custard filled bread for ¥110. The old man thanks me and bows, smiling broadly. 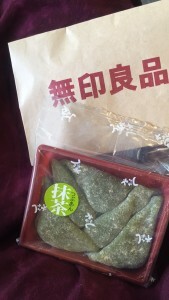 It was delicous; I should have bought two. The end of the massive construction is in sight, it seems that any japanese citizen, or anyone who has seen the destruction can take pride in what has been done here since. But this place will not be recovered until new businesses settle here, until the shinto temples see worshippers, until the the houses become homes. Our next interview was with an organization meant to educate mothers about radiation. This area of Japan was not ordered to evacuate, so I was surprised to see just how concerned some of the mothers we talked to ere about radiation. The first mother we talked to spoke about how the radiation was affecting her family dynamic. She seemed extremely concerned about letting her children play outside, but said her husband did not feel the same. She wants to move further inland away from the power plant in Fukushima, but her husband has obligations he can’t move from. It seemed that just the idea of radiation seemed to be tearing her family apart. It was sad to hear that her children barely see their father because she has moved away from the power plant. I can’t believe how much damage the accident had socially and mentally on families. The next mother that talked to us described how she was afraid to let her children play outside as well. We were shown the levels of radiation in the area and they didn’t seem to be high at all. Yet, they are still so afraid of even the tiniest amounts of radiation. I can’t blame them and think their concerns are somewhat justified. Even exposing children to microscopic amounts of radiation is frightening to think about. The second mother told us she had to be somewhat two faced around some of her friends. She personally believed letting her kids play outside was dangerous, but didn’t want to tell other mothers what to do and so often keeps quiet about the radiation issues. 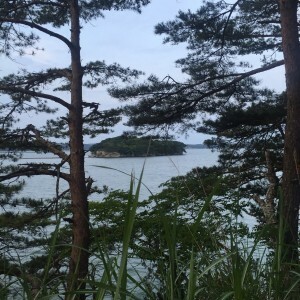 I think the most interesting place that we went was Tomioka. We toured around the city inside the mandatory evacuation zone with a women who lived there. I could not believe she still cannot return to her home. After more than 5 years, she still can’t return to her home and have it repaired. The first thing I noticed when we entered the town was how empty it was. We were the only ones in the area besides police patrolling and there was an eery silence. 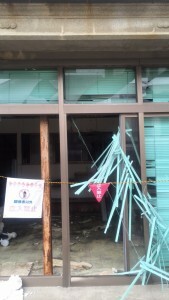 Every building we saw still had some kind of earthquake damage and some had windows smashed by looters. The woman who showed us around informed us someone broke into her house and showed us where the window was smashed open. What disturbed me was how casual she told us this and how robbery seemed to be just an average thing in this situation. Our entire walk through of Tomioka felt wrong. I felt like I was invading the privacy of every home we walked but. I could have gone into any home in the black if I wanted to and that is what scared me the most. The place where I felt most uncomfortable however was at a tsunami memorial site where an elementary school was hit by the tsunami and no one in the school survived. When we got to the memorial it was bright and sunny outside and for the following 30 minutes the only noise was the birds chirping and the ground crunching. Nobody made a sound as we all looked around at the dilapidated remains of the school. At first I followed my professors to where the main memorial was, but I soon felt too uncomfortable and returned to the car. I felt extremely wrong coming to such a personal place and being a foreigner in Japan. 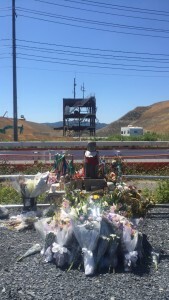 I couldn’t understand how much this memorial meant to the Japanese people so I was worried about being disrespectful.